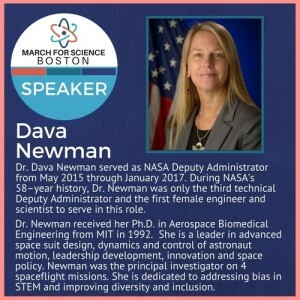 Newman D. Why We Explore Earth and Space: Dava Newman. The Galactic Inquirer. 2017 Apr 27 [last modified: 2018 May 24]. Edition 1. Be bold, be fearless, dream big dreams, and don’t listen to anyone who tells you can’t do something or you don’t belong. Don’t waste your time trying to explain yourself or your identity to anyone. I hope you’ve read the book and seen the movie Hidden Figures. By a show of hands, how many people have? Hidden Figures tells the story of NASA pioneers – Mary Jackson NASA’s first African American engineer and Katherine Johnson. Katherine grew up in segregated West Virginia where her father and mother had to move their family 120 miles away so they could live near a school that allowed African American girls to receive a high school education. team who were referred to as “computers who wear skirts.” Yes, the first computers were human! We all belong, you belong, and I believe we can turn the impossible into the possible! For me, ultimately, science, exploration and discovery are all about raising humanity’s potential. Investment in science, research and technology – helps to cure disease, implement renewable energy, feed the world, and explore the oceans and planets. Scientific research is the lifeblood of a high-tech economy and plays a critical role in the economic and personal well-being of citizens. If America wants to maintain our innovative edge, create new jobs and realize economic growth, then we must fund scientific research as a top national priority. Amelia Earhart said: “Never do things others can and will do, if there are things others cannot do or will not do.” Scientists live these words daily, turning science-fiction dreams into science fact. Science expands the horizons of human possibility. I enjoyed her descriptions of Mary Jackson and Katherine Johnson, who were NASA’s first African American female engineer and mathematician, respectively. Their descriptions gave a further motivation to pursue your dreams, no matter what your background is. Abigail Twombly – Science Communications student at Rockport High School.